I have a weak spot for junk food. Well, all food really, but I do love me some horrible overly-processed or sugary foods sometimes. Like pizza rolls. And Cadbury Creme Eggs. The latter very sadly only available around Easter time (and the former not available in the UAE at all, from what can tell). Today I was grocery shopping and what did I discover but Cadbury Screme Eggs. My delight at this was incomprehensible. These scream eggs are like an oasis in a year-long drought of sugary deliciousness. So this post is for you Cadbury Screme Eggs. Thanks for the October save. 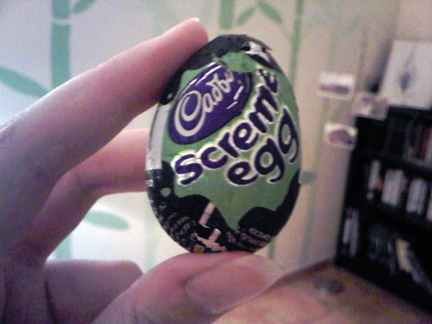 I’ve just bought a Screme Egg as a treat as my children at school told me they had green goo in them – I just had to find out!